Old Spanish, and Portuguese family, identified for some generations with the communal affairs of the London Jewry. The first member to settle in England was the physician and scientist Isaac de Sequeyra Samuda. In 1728 he pronounced a funeral oration over the grave of Haham David Nieto. In the records of Bevis Marks he is described as "Medico do Real Colleges de Londres" and "E. Socia da Real Socièdade." In the early part of the nineteenth century David Samuda founded the firm of David Samuda & Sons, of Leman street, Goodman's Fields, London. In 1789 he was a member of the Board of Deputies. 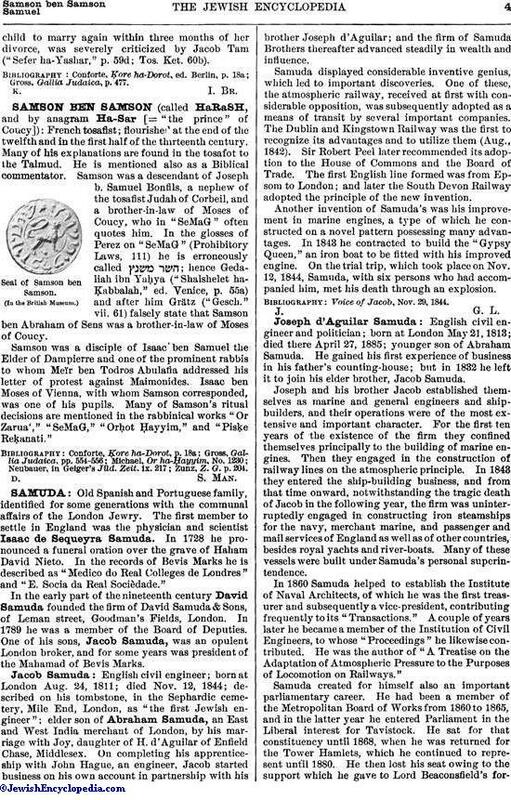 One of his sons, Jacob Samuda, was an opulent London broker, and for some years was president of the Mahamad of Bevis Marks. English civil engineer; born at London Aug. 24, 1811; died Nov. 12, 1844; described on his tombstone, in the Sephardic cemetery, Mile End, London, as "the first Jewish engineer"; elder son of Abraham Samuda, an East and West India merchant of London, by his marriage with Joy, daughter of H. d'Aguilar of Enfield Chase, Middlesex. On completing his apprenticeship with John Hague, an engineer, Jacob started business on his own account in partnership with his brother Joseph d'Aguilar; and the firm of Samuda Brothers thereafter advanced steadily in wealth and influence. Samuda displayed considerable inventive genius, which led to important discoveries. One of these, the atmospheric railway, received at first with considerable opposition, was subsequently adopted as a means of transit by several important companies. The Dublin and Kingstown Railway was the first to recognize its advantages and to utilize them (Aug., 1842). Sir Robert Peel later recommended its adoption to the House of Commons and the Board of Trade. The first English line formed was from Epsom to London; and later the South Devon Railway adopted the principle of the new invention. Another invention of Samuda's was his improvement in marine engines, a type of which he constructed on a novel pattern possessing many advantages. In 1843 he contracted to build the "Gypsy Queen," an iron boat to be fitted with his improved engine. On the trial trip, which took place on Nov. 12, 1844, Samuda, with six persons who had accompanied him, met his death through an explosion. 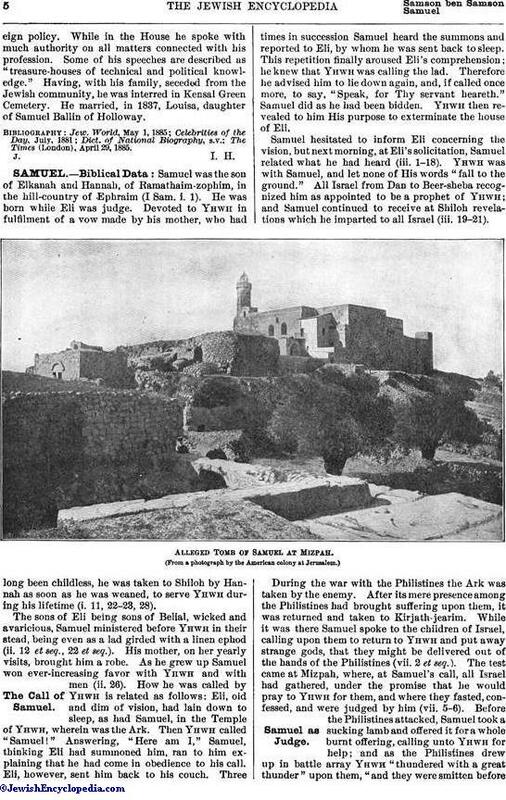 Voice of Jacob, Nov. 29, 1844. English civil engineer and politician; born at London May 21, 1813; died there April 27, 1885; younger son of Abraham Samuda. He gained his first experience of business in his father's counting-house; but in 1832 he left it to join his elder brother, Jacob Samuda. Joseph and his brother Jacob established themselves as marine and general engineers and shipbuilders, and their operations were of the most extensive and important character. For the first ten years of the existence of the firm they confined themselves principally to the building of marine engines. Then they engaged in the construction of railway lines on the atmospheric principle. In 1843 they entered the ship-building business, and from that time onward, notwithstanding the tragic death of Jacob in the following year, the firm was uninterruptedly engaged in constructing iron steamships for the navy, merchant marine, and passenger and mail services of England as well as of other countries, besides royal yachts and river-boats. Many of these vessels were built under Samuda's personal superintendence. In 1860 Samuda helped to establish the Institute of Naval Architects, of which he was the first treasurer and subsequently a vice-president, contributing frequently to its "Transactions." A couple of years later he became a member of the Institution of Civil Engineers, to whose "Proceedings" he likewise contributed. He was the author of "A Treatise on the Adaptation of Atmospheric Pressure to the Purposes of Locomotion on Railways." Samuda created for himself also an important parliamentary career. He had been a member of the Metropolitan Board of Works from 1860 to 1865, and in the latter year he entered Parliament in the Liberal interest for Tavistock. He sat for that constituency until 1868, when he was returned for the Tower Hamlets, which he continued to represent until 1880. He then lost his seat owing to the support which he gave to Lord Beaconsfield's foreignpolicy. While in the House he spoke with much authority on all matters connected with his profession. Some of his speeches are described as "treasure-houses of technical and political knowledge." Having, with his family, seceded from the Jewish community, he was interred in Kensal Green Cemetery. He married, in 1837, Louisa, daughter of Samuel Ballin of Holloway. The Times (London), April 29, 1885.